At last the summer species are here in reasonable numbers. I know that some Bream and Gurnard have been caught for a good few weeks already, but the past few days the numbers have shown that the main run of them have arrived. The water temperature this morning was 15.3 degrees. I looked back on last years temperatures for the same time and we have finally caught up with what the temperature should be. If we continue to get good weather the Trigger fish might show soon. My favourite,the Red Mullet also like warmer water. For those of you that like Mackerel then you will be glad to know that there seems to be plenty on Chesil and Weymouth piers. Swanage Pier and the Cobb at Lyme Regis as well as the harbour at West Bay have all been fishing well for Mackerel and other species such as Bream and Wrasse. I had a trip down to Portland Bill with my camera yesterday, just to take some pictures. If I take a rod down with me I lose concentration on the photography and end up not taking any shots. It was almost impossible to find somewhere to fish around the Bill, due to the number of people swimming in the water and jumping from the rock ledges. I might be worth remembering that if you are looking to come down at the weekend or during the summer holidays. Most of them go home by around 5.30 leaving the mark free for fishing. In case you missed it yesterday, we now have a contributor for the mid Solent area. Lorraine “Lolly” Perry will be providing regular reports from that area. Make sure you take a look at her Solent report. Boat fishing has been fantastic this weekend. I was sent a picture from a friend that went out Bream fishing from Poole. 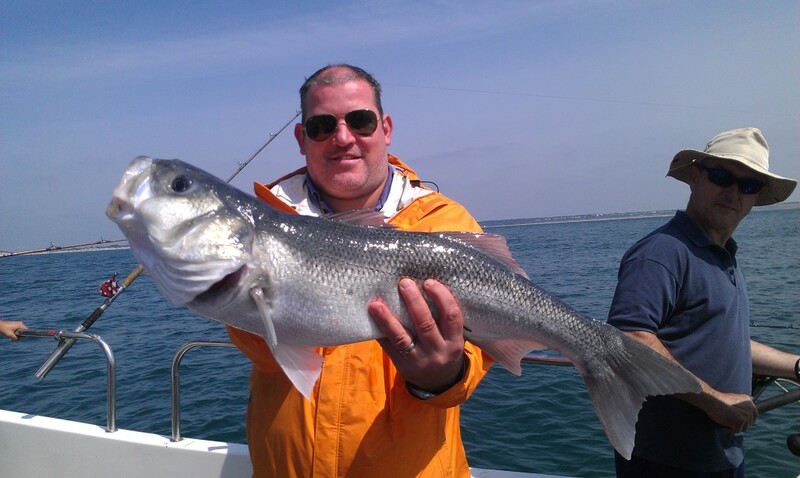 He was using small strips pf Mackerel on a size 4 hook when he hooked into this 9lb 2oz Bass. Chesil Beach forecast: It was a weekend with very mixed results. Some such as my friend Paul managed to find some nice Bream and a lovely Smoothound. Then others like my mate Chris, that came all the way from South Wales, ended up with nothing more than a Wrasse and a small Pout. Unfortunately Bream fishing is a bit like Cod and Plaice fishing, if you are 50m from a holding mark, you may as well be 50 miles away. Thats not to say that is true all the time. As the summer progresses the Bream, like the Plaice spread out along the beach more. At least there was plenty of Mackerel on the beach, but a lot of them were caught at distance. You should be able to pick up plenty in the coming weeks. You have a good chance of picking up Gurnard and Smoothound over the next few days. Bass fishing is going to be a bit quieter until the next blow. Portland: Although there are lots of Wrasse around at the moment, those fishing the Bill have been hampered with people trying to kill themselves from the upper rock platforms. I witnessed a guy that was old enough to know better throw himself from 30ft and land on his back in the water. Once he surfaced he proceeded to throw up about 3 mouthfuls of blood, before his wife had to call an ambulance. If you are looking to target Wrasse then you are going to have to try the Chesil Cove end of Portland and walk towards the Bill. Alternatively you could try Chine on the East side. The Pollock seem to be a bit scarce at the moment, but there have been a few Mackerel and Garfish caught from Portland Bill. Portland Harbour: This was another very busy mark at the weekend, with windsurfers and swimmers it was hard to find anywhere to fish. It should be better during the week. This time of year I would expect to see Bass, Flounder, Pollock and small Wrasse. I prefer to lure fish the harbour, unless I am targeting the Gilthead Bream. I have only heard of a couple of Gilthead’s being landed from the shore. Mussels and Crab baits work best for them. Weymouth Bay: Plenty of different species coming from the piers. Mackerel and Garfish can be caught on small lures. If you want to use bait then just drop a line down the side of the pier for Wrasse, Pollock, Pout and small Bream. The harbour is full of Mullet. I can’t ever remember seeing so many Mullet in the harbour. Some of them are huge. Take a loaf of bread and a light rod to try and catch them. I love using floating bread crust, as I like to see the Mullet take the bait. Preston Beach should produce all different types of flat fish, as well as Rays and Gurnard. There is always a chance of a Smoothound or Bass as well. 6 Responses to "Catch report & fishing forecast for Dorset including Chesil Beach, Portland & Weymouth"
I watched hundreds of people around chesil cove feathering all day and evening with no luck. I was bait fishing and only had one dogfish the whole 12 hours i was there. Water was crystal clear. That’s because (as Sean said t’other day), there was a band of cooler water further off the beach where the bait fish were congregated. This meant the mackerel were also there feeding on them. We need a patch of ‘rougher’ less settled weather to kickstart things in my opinion. You are right Matty. We are never pleased though are we. We want great weather, but it is not great for the fishing. I was at Chesil for 6 hours on Saturday and didn’t catch anything. I was only using feathers. I’m thinking about going tomorrow (Thursday 17th July) Has anyone been catching mackerel over the past few days? It’s about an hours drive for me so wanted to see if anyone could give me a heads up. Thanks. If it’s of help to anyone, pure white feathers with a red spec at the hook eye proved to be the winners for us last week, nothing on the silver ones, watch the sales rocket at the tackle shops and online! Good night at Abbotsbury last night. Fished from 6.30 till 9.00. Caught 14 Mackerel between two of us. Around 8.30, just around sunset. Everyone seemed to be getting good results. Distance on the cast was the answer.